Absolutely stunning 5000 square foot estate directly on Lemon Bay. This 5 bed, 5 bath home sits on 1.3 acres of pristine land with wonderful landscaping and palm trees to add to the ambience. Built in 2000 but thoroughly updated with hurricane windows/doors as well as an updated kitchen and master bath. As you enter you will be greeted with a 2 story foyer, a gorgeous wrap around staircase and a 2 story formal living room with fireplace and French doors leading you to the porch, pool and wonderful bay views. Master bedroom is on the main level with amazing water views and a huge master bath that was recently updated. The family room also has direct full window views of the water, with 12 foot ceilings, a fireplace, and a fantastic open design to the kitchen area. Kitchen has almost brand new appliances, wonderful granite and nice details to please the chef and the guests! The informal dining area is surrounded with glass on 3 sides and enjoys wonderful water views. Formal dining and a huge office finish off the main level with views down your expansive 400 ft of private front yard. There are 4 additional large bedrooms upstairs (2 of which are en-suite). 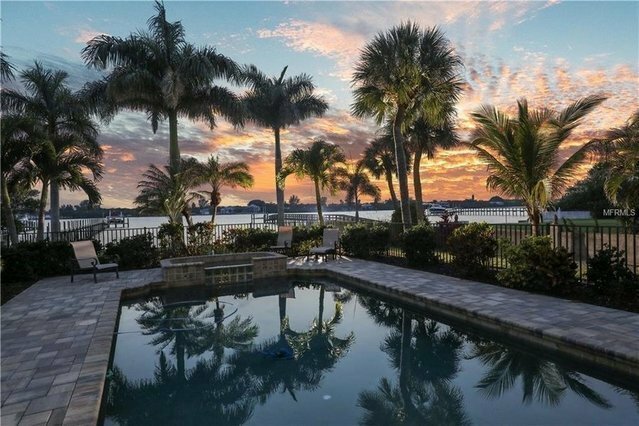 There is an absolutely wonderful Bayfront deck on the upper level as well, that not only enhances the bay views for sunsets but also allows for some views over Manasota Key to the Gulf of Mexico. Oversize 3 car garage has plenty of extra room for storage. Long dock (approx. 250 ft) onto lemon bay assures year round boating and enjoyment.